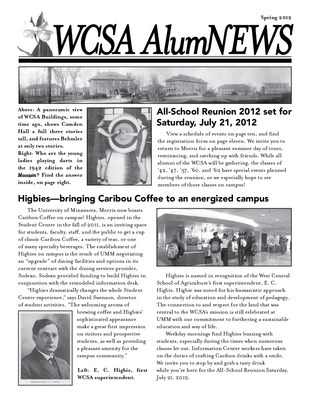 The WCSA AlumNEWS is the biannual publication for alumni of the West Central School of Agriculture. 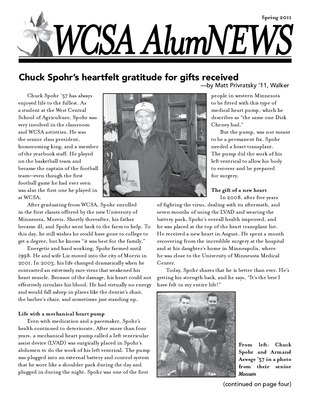 This publication is published through a joint effort by the University of Minnesota, Morris Office of External Relations and the WCSA Alumni Association. 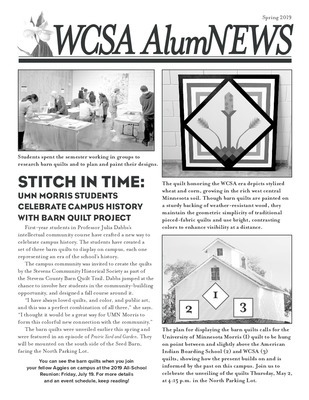 Contents include: Stitch in time: UMN Morris students celebrate campus history with barn quilt project; Greetings from Coordinator of Alumni Relations Kaitlyn McBrady '13; Joan T.A. Gabel appointed 17th University of Minnesota president; Greetings from Alumni Association President Tom Payne '60; WCSA Arizona gathering 2019; Calendar of events; WCSA Texas reunion 2019; Save-the-date for 2020 WCSA winter gatherings in warm places! 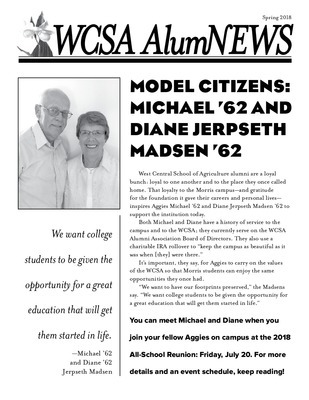 ; In your words: Aggies share memories from their days at WCSA: Jerry Koosman '60 recalls his decision to attend the WCSA--and how he found a way to pay for it! 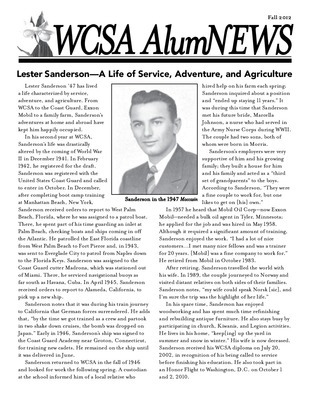 ; Ted Storck '54 recalls a chemistry class in Ag Hall; Class notes; Fondly remembered; 2019 WCSA All-School Reunion. 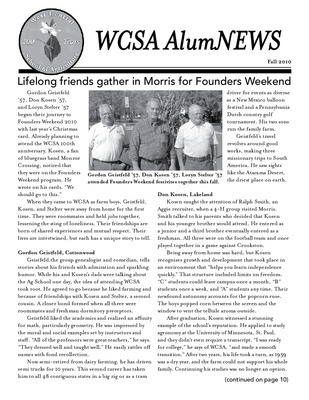 Contents include: WCSA Aggies support Edson Auditorium renovation; Board members and officers elected; WCSA alumni garden planting; Greetings from Alumni Association president Tom Payne '60; Campus accolades abound; Greetings from Coordinator of Alumni Relations Kaitlyn McBrady '13; Summer 2018 all-school reunion; WCSA winter gatherings in warm places; In your words-Aggies share memories from their days at WCSA; More life and times in the military, told by Ted Storck '54; Class notes; From the West Central school to West Union, SC: Ronald August Bode '60; Calendar of events; Fondly remembered. Contents include: Model citizens: Michael '62 and Diane Jerpseth Madsen '62; The shape of things: campaign progress to-date; Greetings from Coordinator of Alumni Relations Kaitlyn McBrady '13; Greetings from Alumni Association President Tom Payne '60; Winter in warm places; Calendar of events; Life and times in the military, told by Ted Storck '54; Class notes; Fondly remembered; 2018 WCSA All-School Reunion information. 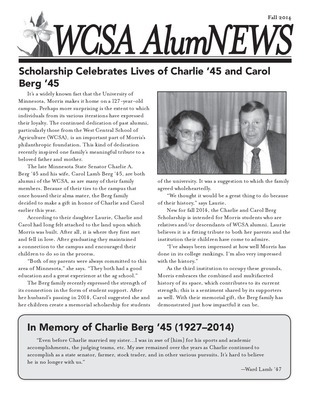 Contents include: Scholarship celebrates lives of Charlie '45 and Carol Berg '45; Greetings from the Director of External Relations; Campus accolades; Morris earns two college success grants from Great Lakes Higher Education Guaranty Corporation; Greetings from the Alumni Association President; Summer 2014 All-School Reunion; New Board members and officers elected; 2014 WCSA Alumni Garden planting; WCSA winter gatherings in warm places; Class notes; Fondly remembered...; Courtyard renovation completed; Legacy Walkway joins courtyards to campus; Mystery WCSA photo. 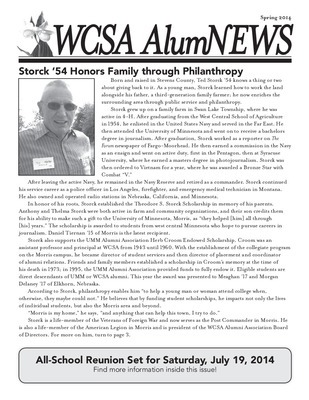 Contents include: Storck '54 honors family through philanthropy; Greetings from the Director of Alumni Relations and Annual Giving; University of Minnesota, Morris news briefs; Greetings from the Alumni Association president; WCSA All-School Winter Reunion 2014; Texas Winter WCSA gathering 2014; Class notes; Fondly remembered...; WCSA Alumni Garden planting; 2014 All-School Reunion tentative schedule of events. Contents include: All-school reunion 2012 set for Saturday, July 21, 2012; Higbies--bringing Caribou Coffee to an energized campus; Greetings from the Director of Alumni Relations and Annual Giving; University of Minnesota, Morris happenings; Welcome Center rated Gold; Greetings from the Alumni Association President; Calendar of events; WCSA Alumni Garden planting; Class news; Report from the field: Loren Shoquist '55; Remembering Harriet Vaala Payne, WCSA Class of 1960; From the WCSA all the way to Arizona... and Texas! ; Class announcements for All-School Reunion. 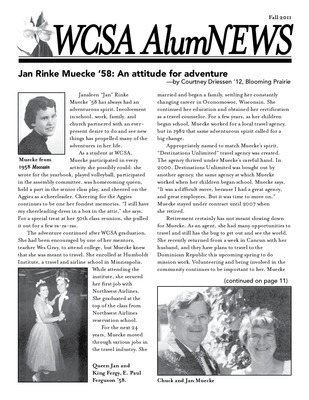 Contents include: Jan Rinke Muecke '58: an attitude for adventure, by Courtney Driessen '12; Greetings from the Director of Alumni Relations and Annual Giving; University of Minnesota, Morris news briefs; WCSA winter gatherings in warm places; Greetings from the Alumni Association President; 2011 scholarship recipient; Promise of the Prairie receives Communicators Forum Gold Award; New board members and officers elected; Morris's new wind turbine dedicated; Welcome Center receives Sustainable Design Award; West Central School of Agriculture 2011 All-School Reunion scrapbook; Class news; WCSA alumni receive 2011 Jefferson Award nominations; Calendar of events. 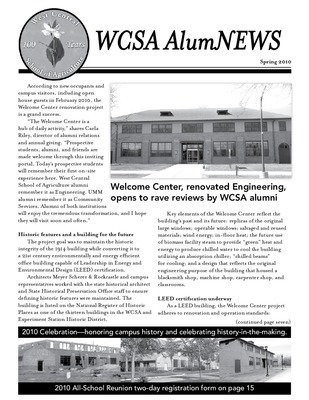 Contents include: Welcome Center, renovated Engineering, opens to rave reviews by WCSA Alumni; Greetings from the Director of Alumni Relations and Annual Giving; Morris campus receives major renewable energy related grants; BikeShare program: Class of 2010 invites your participation; Greetings from the Alumni Association President; WCSA garden planting scheduled; Opportunities throughout 2010 to celebrate a special year in University of Minnesota history; Legacy Walk celebrates historic 2010; WCSA Alumni Association 2010 plaque project; Class news; Arlene Yochem Ulstad '51 remembers the Moccasin; 2010 Texas Winter Reunion in McAllen; 2010 Arizona Winter Reunion; Class announcements for All-School Reunion. 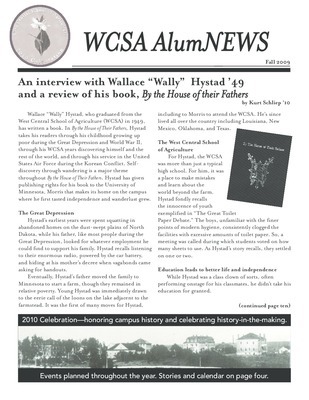 Contents include: An interview with Wallace "Wally" Hystad '49 and a review of his book, By the House of their Fathers by Kurt Schliep '10; Greetings from the Director of Alumni Relations and Annual Giving; Scholarship project initiated by Torvik '56 reaches endowment level; Thank you to new and outgoing WCSA directors; Warm weather winter gatherings of WCSA alumni; Greetings from the Alumni Association President; Calendar of events; 2010 Celebration web page; WCSA Alumni Association 2010 plaque project; 2010 Celebration to honor Morris campus history and celebrate history-in-the-making; 2009 all-school reunion scrapbook; Class news; Scholarship Jubilee honors scholarship recipients and donors.